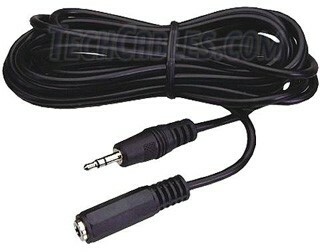 This is a 25 ft. long, 3.5mm (1/8") stereo audio extension cable. One end of the cable has a male 3.5mm mini plug (the kind that plugs into a portable music player) and the other end has a female 3.5mm mini jack. This cable works great as an extension for stereo headphones, speakers, microphones etc.